Third-Party ESG (Environmental, Social, and Governance) Evaluations - Company information | Yamaha Motor Co., Ltd.
With an increasing emphasis on socially responsible investment (SRI) that identifies companies for investment using evaluations from environmental and social perspectives in addition to financial analysis, Yamaha Motor proactively releases ESG-related information. The following are some of third-party evaluations we have received. Yamaha Motor was among the 150 companies included in the 2018 Morningstar Socially Responsible Investment Index (MS-SRI), Japan’s first stock price index for socially responsible investment. 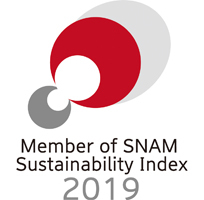 Yamaha Motor was included in the 2018 SNAM Sustainability Index, managed by Sompo Japan Nipponkoa Asset Management Co., Ltd., to facilitate SRI for pension funds and institutional investors investing in a broad range of companies that are highly rated for their environmental, social, and governance activities. Yamaha Motor was recognized in 2018 in the Certified Health and Productivity Management Organization Recognition Program – White 500, established by the Ministry of Economy, Trade and Industry to recognize outstanding companies and organizations for their health and productivity management.